Big news! With help from the Bicycle Coalition of Greater Philadelphia and the Pennsylvania Environmental Council (PEC), our region has secured $23 million in recovery money from the U.S. Department of Transportation's Transportation Investment Generating Economic Recovery (TIGER) Discretionary Grant Program. The multi-jurisdictional project—dubbed Generating Recovery by Enhancing Active Transportation in Pennsylvania and New Jersey (GREAT-PA/NJ)—will be instrumental to the completion of biking and walking trails throughout the region. 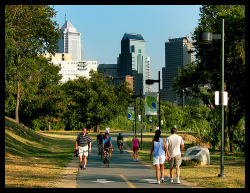 One of the key projects is the completion of the Schuylkill River Trail. (This Grad Hop resident could not have more love for Schuylkill Banks.) The East Coast Greenway Project will also get some love. This really is tremendously exciting news for all Philadelphians who enjoy biking, walking, running or strolling.